Learn how to thrive in this red-hot career track. For social workers seeking to boost their incomes, diversify their caseloads, or simply explore new opportunities, the big-sky world of coaching may seem like the Promised Land. Who among us hasn’t been tempted by those splashy advertisements that woo us with promises of executive-level compensation, uber-motivated clients, and ample leisure time? By now, we all know the frequently asked questions about coaching. But the $64,000 question remains: What separates the highly successful coaches from the also-rans? And do good opportunities still exist or is the field glutted and running on empty? Seeking answers, Social Work Today asked three industry leaders—two of them “mega-coaches”—for the keys to their success. Social workers accustomed to stingy managed care reimbursements may find talk of $175 cash per (brief) session irresistible, but most coaches earn far less than advertised. In a major study in 2003, an International Coach Federation (ICF) survey found that 70% of coaches earned less than $50,000 annually and 37% less than $10,000. While some practitioners do well, the ICF study found that only 10% of coaches earned $100,000, and these statistical outliers tended to be coaches to Fortune 500 America. The ICF study also found that close to 100% of respondents engaged in primarily one-on-one coaching rather than conducting the group telesessions so many Web sites today hawk as a financial goldmine. While the ICF figures are admittedly dated, they do provide a clear snapshot of the industry, and the picture reveals that in the world of coaching—much like in the world of sales—a minority of individuals enjoy the lion’s share of earnings. As the ranks of coaches swell each year, observers wonder whether supply has outstripped demand and the arena is in danger of becoming saturated. Others opine that the best money lies not in coaching individuals but in coaching those who seek to coach individuals. As a historical case in point, consider the critical-incident stress debriefing industry that was all the rage early last decade before research finally caught up with it. “Let’s remember there are more than 500,000 psychotherapists nationwide vs. maybe 30,000 to 50,000 coaches—and coaching is an easier sell than psychotherapy, so I see [coaching] as a growth market,” Grodzki says. And she should know. In recent years, she has penned several books on helping coaches and social workers grow their businesses, the latest one being Crisis-Proof Your Practice: How to Survive and Thrive in an Uncertain Economy. Today’s new coaches may indeed face stiff competition, says Leshinsky, but they also have a vast wealth of resources and expertise at their fingertips to help them succeed. As the industry matures, coaches need first-rate credentials to sell themselves as experts. Getting the best training and highest credentialing available is a good first start. Be bold but also be prudent. New coaches seeking to get up and running as soon as possible sometimes fall for the promises of ultra-accelerated training courses. Social work therapists accustomed to rigorous education, intensive training, and exacting licensure are often astonished to find the frontier of the coaching world largely unmarshaled. Be advised that the same know-nothing who can become a coach at a two-day program in a Las Vegas casino-hotel can also launch his own coaching “institute.” Credentialing is strictly voluntary and regulatory constraints are nil. D’Alessio adds, “Coaching is a reputable profession, and any profession in the social area requires preparation, training, integrity, and the ability to maintain a professional relationship with clients.” It takes time and effort, she says, to build a successful practice—and even longer to acquire mastery as a coach, even for veteran social workers. A common denominator among many individuals who throw in the towel is not their lack of proficiency as coaches but their mistake in “focusing too long and exclusively on personal development at the expense of mastering critical skill sets,” Leshinsky notes. Soured on their experience, they leave the field believing the cards are stacked against everyone. What they fail to realize, she says, is that acquiring the core competencies of coaching is a very doable proposition. “To succeed as a coach, you need to hone your foundational business skills and never forget that you’re trying to grow a business,” Grodzki adds. To succeed, you need to be as conversant in calculating cash flow and crafting a cost-effective social media marketing plan as you are in helping clients solve problems. Today Grodzki divides her time evenly between working as a psychodynamic psychotherapist and providing expert business counsel to other coaches. Echoing her earlier observation, she says a coaching business follows the same arc as “most other small start-ups: initial slow growth and slow earnings.” To succeed, new coaches need to adopt an entrepreneur’s perspective—and a marathoner’s fortitude. The ICF survey revealed in 2003 what remains true today: Executive and leadership coaches command the highest earnings, but reaching the pinnacle of this sharp-elbowed field requires sterling business credentials. “A lot of consulting firms have gone into coaching, so it’s hard for the independent therapist to battle their huge staffs, deep experience, and major marketing initiatives,” Grodzki observes. The ICF survey found that the second-highest earnings are garnered by business coaches who help small- to medium-sized companies improve their profitability, time management, goal setting, and similar corporate considerations. Placing third in earnings are what Grodzki calls skills coaches, whose specialties may range from showing sales teams how to refine their presentations to helping a CEO better manage a critical television interview. The ICF survey also determined that 85% of coaches originated from inside the business world (typically as human relations professionals or consultants), while only 15% came from the mental health sector. In recent years, however, increasing numbers of social workers have joined the ranks of business specialists. Leshinsky notes that “soft niches” typically pay less, but competition remains keen. “It is very rare that I’ve seen a niche that is too narrow,” she says. Social workers turned coaches can specialize in any number of niches: relationships, parenting, health and wellness, retirement issues, and more. “The social worker who enjoys working with caretakers of Alzheimer’s patients may decide to specialize in that niche as a coach,” Leshinsky says. Similarly, social workers with suitable experience may find coaching opportunities as diverse as vocal performance, weight loss, and providing assistance to budding or struggling actors or artists. 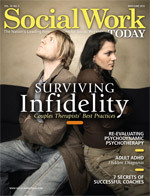 The medical social worker intrigued with serving as a coach to emergency department physicians, psychiatrists, or cardiac surgeons or to hospital administrators needs to be intimately aware of “their lifestyles, their challenges, their struggles, and what keeps them up at night,” Leshinsky says. Medical social workers may consider coaching professionals from any number of disciplines on issues of life balance and stress reduction. “You can specialize as deep as you want, or you can stay near the surface of a particular group of people,” she says. Whether you seek to coach baby boomers with diabetes, Gen Xers with Crohn’s disease, Gen Yers with metabolic syndrome, or parents of teens with attention-deficit/hyperactivity disorder, Internet addiction, or academic underachievement, Leshinsky says it is important to know their “hot trigger points.” To build a thriving practice, you must attract a client base. Whether you think of it as guerrilla marketing or doing effective outreach, being a successful coach entails two parts problem solving and one part self-promotion. Since insurance companies will not be sending you clients, it’s incumbent on you to identify, locate, and attract business prospects and keep them coming and referring others. • Web site: Create a highly informative Web site that answers questions while encouraging visitors to seek your services, possibly by having them sign up for a free e-course. • E-newsletters: Again, offer helpful information tailored to your audience’s needs, but don’t forget to call your prospects to action. • Articles: Gain recognition as an expert by getting your articles published in trade and glossy magazines, mass-circulation newspapers, and on article-submission sites such as www.ezinearticles.com. Focus your pieces on solving problems and prompting prospects to take action, be it by buying a CD or enrolling in one of your just-launched programs. • Teleseminars: After beefing up your database—Leshinsky suggests reaching 500 prospects first—deepen the connection by offering a free teleseminar. For ideas, turn your best articles into a series of downloadable presentations. • Partner with others: Build strategic alliances with clubs, associations, and professional societies that already possess mature databases. “Tap into their lists, offer their members a free teleseminar, and then encourage them to visit your Web site and join your list,” Leshinsky advises. Finally, be mindful that social media (blogging, Facebook, Twitter, YouTube, etc.) can vastly increase the number of people visiting your Web site and at no expense to you. “When you are educating people by way of a blog filled with resources, people want to hire you because they already know you,” Leshinsky says. The popular e-tool WordPress gives new coaches the ability to be up and blogging in minutes. As always, focus on writing brief, informative content that really resonates with your target audience. Just as there is no universal definition of success in life, there is no one benchmark for success in coaching. For some coaches, success may mean writing 10 books, penning 50 magazine articles, claiming 2,000 Facebook followers, and appearing on both Larry King and Oprah in the same month. For others, it may mean making a meaningful difference in the lives of 20 clients each year and letting coaching be a small, if fascinating, adjunct to clinical practice. Above all, if business is slow, resist the mental quicksand of doubting your effectiveness as a coach. Similarly, if circumstances allow, consider pursuing your bliss. If helping infertile couples or the children of low-income families appeals to you, let your gift for coaching be the genie that makes dreams come true. — Matthew Robb, MSW, LCSW-C, is a social worker and freelance writer residing in suburban Washington, DC.